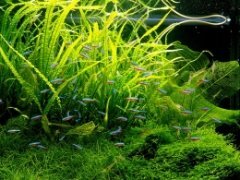 What about a post for beginners trying to find an affordable way to light their planted tank? Lights can be rather expensive and all the options are daunting. Can screw-in type compact fluorescent bulbs be used? Yes. It's not quite as efficient as compact-fluorescent tubes, but it will work, and can be much cheaper. Just make sure to get the right spectrum light bulbs! There are many fish that don't really work well with planted tanks. For starters, there are fish who eat plants in the wild and should not be kept with them unless you want your plants all torn up. Some of these include Silver Dollars, some loaches, Rummynose tetras, and I'm sure I'm forgetting a bunch. Also, most cichlids and goldfish cannot be kept with plants except maybe the hardiest plants (anubias, java fern) since they will rip up/eat most plants. I'll try to come up with a comprehensive list in a new post! What about an article on using Leaf Litter in Aquascaping? Or, aquascaping a Coldwater aquarium? These are great ideas. 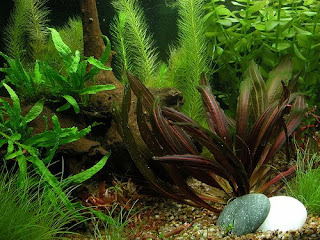 The principles would probably stay the same as aquascaping a regular planted aquarium, however, you'd have to select species of plants that would grow well, or aquascape without plants at all (it can be done!). Awesome! thanks so much! Just one last question on using CF screw in type light bulbs - on the packaging, they give two wattage ratings, the actual usage and the equivalent incandescent wattage. Which one do I refer to? I don't want so much wattage in my little 29G tank that I have uncontrollable algae blooms! Thanks again for your wonderful blog, I love it! Since when do Rummy Nose Tetra's eat plants? Half of Amano's tanks are full of them and I keep a school - they school beautifully and behave impeccably. Rummy nose tetra are the number one most common choice of fish in planted show tanks, and DO NOT damage plants! Have you been smoking CRACK?